I’m so excited. I’m doing something I’ve never done. I’m starting a review before I’ve played a game. I even went out and grabbed a bottle of mead to celebrate. Judge me if you’d like; I’m happily swilling back chilled honey goodness as I wait for it to download. And why wouldn’t I be excited?! 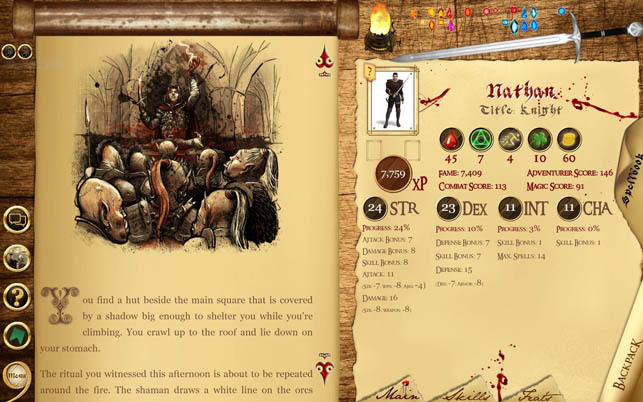 I am a D&D fan from way back, and when I found Narborion Saga was promising me epic high fantasy, role playing, dungeons, mini-games and more, all shoved into an interactive gamebook (! ), I could barely control my inner child which was gleefully jumping inside of my stomach, like an 8 year-old in a bouncy house, causing innumerous butterflies to commandeer my midsection. This might be more exciting to me than my first date with the High School quarterback. Who am I kidding? At this point we all know THAT didn’t happen. But the excitement for this title did. Did the release match my excitement level? Read on. While I eagerly awaited the downloading of Narborion Saga to finish, I headed over to Liber Primus Games’ website. And of course, clicked on the teaser. Man, oh man. The soundtrack playing in the background added kindling to my fire of excitement. I felt like I could stand on my computer desk and jump, flying off into the air like some housebound harpy. This was going to be fun. 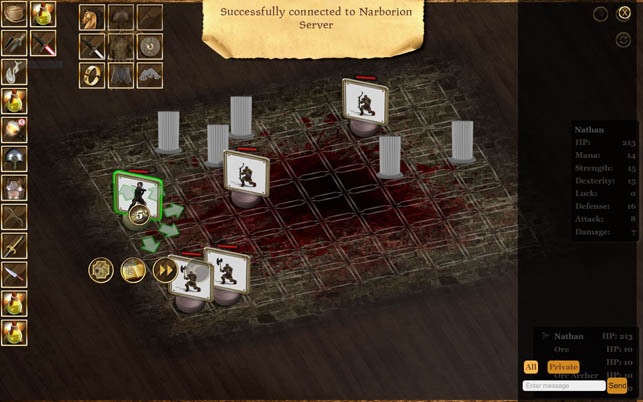 Narborion Saga was released a few years ago as a mobile app, and has just migrated to Steam as a PC game. It can be played in multiplayer (in…THE ARENA) or a single player, RPG that conducts itself like a Choose Your Own Adventure story. Allow me to start with the negative: the fact that the lion’s share isn’t about playing but reading instead, leads me to a very large elephant in the room that, sadly, must be addressed. Now that the elephant has been exposed, let’s move on. Narborion Saga has all the elements required to be complex and yet, it makes for a great entry title for anyone interested in the genre. All the tools needed to play have been diligently provided, and a Player’s Guide is found on the starting screen. If you haven’t already logged time on the mobile version, you can catch up quickly. If you’re like me and eschew reading directions in favor of hopping into the action immediately, you’ll anyhow find your bearings sooner rather than later. In terms of features, I’ll start with the soundtrack. It’s exhilarating and while enjoyable at first, that eventually gets in the way of your concentration, as it becomes hard to focus on the reading. The artwork, on the other hand, make for a beautiful illustration of the universe you learn of through your readings, and are wonderful images that portray the characters you have chosen. The high fantasy elements, almost a prerequisite in any such tale of the genre, are here. Avoiding spoilers, I’ll stop there and instead share with those educated in Greek mythology that the plot rivals that of Hades and Persophene. You’re a lowly creature, a squire, sent on a mission to save the world. An unlikely hero, you’re sent on a quest to save the day, the hero/ine, and a few goblins along the way. Something I found a bit surprising in a title that offers a role of importance to transgender identity, was that as a player, you lack the option to play as a male or female, and are only afforded the former. I think, after delving more into the game, that this is simply due to the complexity of the written material. I would imagine it’s nearly impossible to make sure you have s/he factored into every single page of text. It didn’t bother me, however; Narborion Saga offers a very engaging storyline, and I felt like a properly masculine squire from beginning to end. Not to mention I picked a very handsome protagonist, whose attributes made my superficial nature quite happy. And, you can change your character as often as you please, unlocking more characters as you progress through the story. One of the more welcomed features is your ability to save anytime at your discretion, and I realized relatively quickly that Narborion Saga’s Bookmarks would be in the many. I would indeed advise to save frequently, to better cope with the times your character makes horrible choices and you end up, well, dead. Bookmarks are free, as opposed to the mobile version of the game, and you don’t have to choose between upgrading equipment and saving your play at a pivotal moment. As I am the self-proclaimed Queen of Indecisiveness, it helped ,e immensely when faced with decisions such as: GO TO THE KITCHEN or GO UPSTAIRS. Which, as you probably know, is a VERY stressful and important choice in a gamebook situation. Another feature I found handy was in potion and food consumption. By drinking health potions, for example, at any time, you can raise your hit points, and the practice leads to developing a strong character - if done wisely. It’s also possible to use potions while engaged in battle, and fighting, you’ll rejoice to learn, happens as in board games. Think FFG’s Descent – and not Street Fighter - has come to life on your PC: you will have a limited number of movements that can be built upon as you progress in levels, and must remember to reserve a move to attack an enemy. If you’ve never played a title like this, you’ll find yourself on a grid (most with cute little trees or such, that can also be broken) and can choose to move as you would on a chessboard; forward, back, side to side, or diagonally. Your turn can be halted at any time, which is handy if you’re trying to maneuver yourself into a strategic position. In battles, you’ll face spiders, trolls, vampires, and so much more, you shall not be bored when it comes to fodder for your weapons. Once the battle is over, you’ll transition back to the gamebook; picking up loot if there was any, and being afforded the options to spend feat, skill and magic points as you level up. While engaged in the open map exploration, you’ll come upon landmarks that, once chosen, will trigger more written gameplay. You may camp at night while exploring, where you can train to gain dexterity, strength, intelligence, charisma…or you can choose to rest, or even create weapons that will go into your trusty backpack to sell at a later time. 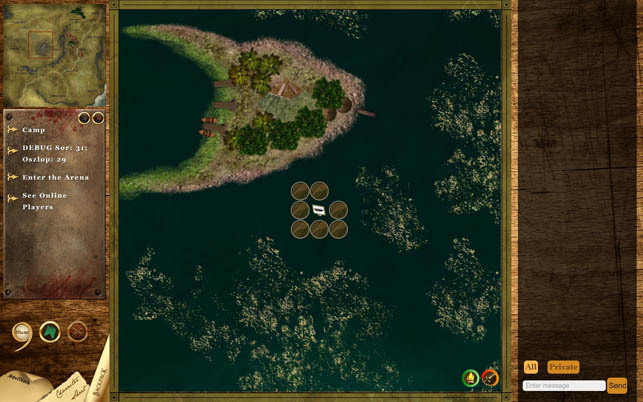 When outside open areas or when taking breaks from battling ogres, you’ll be faced with decisions that may seem trivial but could result in major happenings. Something that seems as simple as declining a wedding invitation can lead to catastrophe; decisions that feel like you are “doing the right thing” may have disastrous results. Playing Narborion Saga by making the decisions you’d actually make in real life is the way to go. You may end up dead, but, hey! Live dangerously, I say. While playing, I chose an option of “Go into the Kitchen”. It was a broken link, and led to an “oops” page which offered a reward upon submission of an email detailing the issue. I emailed, not expecting much as it was nearly midnight on a Saturday, but within minutes, I had gotten a reply from the Powers That Be, thanking me for the time in reporting the issue, and asking for a bit more information. It was a pleasant interaction, and I was happily surprised when I woke up to a second email stating that the problem had been fixed, and that I was now able to go back to that mission should I choose to do so, and play the missing content. Bravo, Liber Primus!! That interaction makes it so abundantly obvious that you want your players to have a multi-level experience (a good one!). Narborion Saga is a wonderful melding of multiple genres, merging High Fantasy RPGs, Visual Novels á la Choose Your Own Adventure, and Dice Rolling games reminiscent of the good ol’ D&D days. Dungeon crawling, open maps to explore, treasures to find, enemies to fight, skill points to use… The list goes on and on. 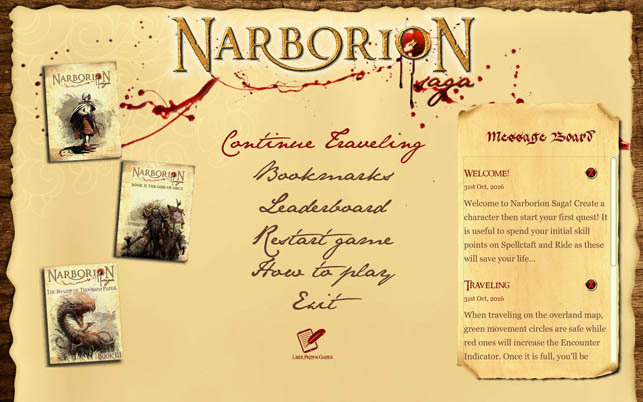 Narborion Saga offers something for almost everyone, and it’s easy to lose yourself for hours on end. You may need to adjust your expectations if you’re a die-hard fan of epic novels and the fantastic. While the emerging storylines are very engaging, you aren’t reading the newest Terry Brooks. The writing is at times a bit stiff and awkward, but if you proceed in the manner that you are in fact, playing a game and not reading a novel, you shall quickly become so caught up in the combination of storytelling, action, brawling and di rolling that a bit of weakness in verbiage won’t matter as much as you’d think.